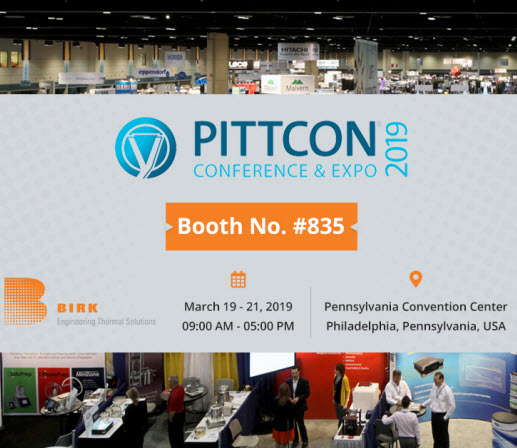 Birk Manufacturing , a leading manufacturer of custom flexible heating elements and flexible heaters, has announced its participation at Pittcon 2019. The company will showcase its innovative thermal management solutions at at the 2019 Pittcon Conference and Expo,booth 835 | March 19-21, 2019. Specializing in flexible heaters equipped with silicone rubber, Kapton®, mica-insulated, and butyl rubber heating elements, Birk Manufacturing offers thermal solutions in custom specifications to meet client requirements. In addition to these heating elements, the company will also display its other best-selling thermal solutions, including temperature probes, surface mount sensors, bare elements such as RTD and thermocouple sensors. Birk Manufacturing is a preferred global Kapton® (polyimide) heater manufacturer. Its Kapton flexible heaters assure superior tear resistance and tensile strength and even heat distribution, a major requirement in several industries. These heaters are designed to integrate easily into assemblies equipped with sensors, fuses, heat sinks, probes and several other electronics. The team at Birk Manufacturing builds innovative solutions to meet diverse thermal challenges, specializing in custom-engineered solutions. “We are happy to be part of the prestigious Pittcon Conference and Expo 2019, which is one of the most-awaited events of the year. As the event is all about laboratory science, where thermal management has a great role to play, so we believe it will be a perfect occasion for us to showcase our capabilities and products as well as expertise in thermal management to attendees coming to our booth,” said Norman Birk, Chief Executive Officer for Birk Manufacturing. Pittcon 2019 acknowledges and discusses innovations in laboratory science. It is the world’s leading annual conference and expo, attracting industry leaders, academics and governmental bodies from over 90 countries. This global expo allows attendees to gain insight into the latest laboratory instrumentation, take part in product seminars and live demos, talk to experts and find solutions to any laboratory challenge. You can visit Birk Manufacturing’s booth to see its quality products and ask thermal experts how they can help you overcome thermal management challenges in the laboratory. Founded in 1989, Birk Manufacturing is an industry leader in thermal management solutions as well as custom turnkey thermal solutions. The Birk team’s high quality standards assure stricter product tolerances. This commitment to quality and precision has helped the company earn certifications such as AS9100, ISO 13485/9001 and ITAR. Birk operates a 36,000-square-foot manufacturing facility in East Lyme, Connecticut, producing custom thermal solutions for its clients in the medical, semiconductor, defense, aerospace and HVAC industries.